During the Second World War Roald Dahl served in the RAF and even suffered horrific injuries in an air crash in the Libyan Desert. Drawing on his own experience as a fighter pilot, Dahl crafted these ten spine-tingling stories: of air battles in the sky; of the nightmare of being shot down; the infectious madness of conflict; and the nervy jollity of the Mess and Ops room. Dahl brilliantly conveys the bizarre reality of a wartime pilot's daily existence, where death is a constant companion and life is lived from one heartbeat to the next. Stories about flyers in Royal Air Force in WWII based on Dahl's experiences as an RAF pilot. 1st UK edition. Blue cloth hardcover book in very good condition. Dust jacket in good condition; some wear along edges, corners; small closed tear back cover; price clipped. Dust jacket in protective Mylar cover. 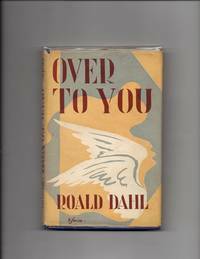 Signed by Dahl in blue ink, dated Sept. 1951, Amersham. Penguin Books Ltd, 1977. Cover has slight marks, slight edge wear, slight crease top & and base of back. Inside pages clean & tight to binding. Signed and dedication by author, "Celia Love".. Signed by Author. Reprint. Good/No Jacket. D. Paperback. London: Hamish Hamilton,, 1946. 10 Stories of Flyers and Flying. Octavo. Original blue cloth, lettering to spine gilt. With the dust jacket. A very good, lightly toned copy in the price-clipped, lightly foxed dust jacket. First UK edition, first impression, preceded in the same year by the US edition. A collection of stories based on Dahl's experiences in the Royal Air Force during the Second World War, Over to You was Dahl's second book, his first of short stories and his first for adults. Hamish Hamilton. First edition and first print published by Hamish Hamiliton in 1946. This copy is in very good + condition. The book is very tidy with bright boards, no previous owners ink and no foxing or spotting at all. The wrapper is very complete and not price clipped. Some minor wear to the top of the spine. Overall very good + Over to You: Ten Stories of Flyers and Flying is a collection of short stories by Roald Dahl. His first adult title . Very Good. Hardcover. 1st Edition. 1st Printing. 1946. NY: Reynal & Hitchcock, 1946. The dust jacket shows one pencil eraser sized chip to the bottom of the front panel and one sticker removal spot to the spine (not affecting any text. This is the first U.S. edition of the author's first of short stories. The dust jacket maintains the price of $2.50 at the bottom of the text on the front flap. 182 pp.. First Edition. Hard Cover. VG+/VG. London: Hamish Hamilton, 1946. Bound in the publishers blue cloth boards with gilt title lettering to spine. This is the first impression of the first edition. Housed in the good only dustwrapper with chip to front panel and slight loss to top of spine. A scarce Roald Dahl title. Ten stories about flyers and their flying.. First Edition. Good/Good. FIRST EDITION. London: Hamish Hamilton, 1946. First Edition . Hardcover. Very Good/Very Good. Ten stories of flying. No inscriptions, not price clipped. Nice tight copy. Jacket a little foxed but very good with two tiny closed tears. London: Hamish Hamilton, 1946. 180pp; Slight shelf wear to edges and head and tail of spine; Prelims. a little yellowed; Price-clipped d/w slightly chipped and frayed along edges; Inside flap repaired with tape and part of inside flap text removed with small price-stckers; Else a bright and sound copy; In protective sleeving; Digital photos available on request;. First Edition. Cloth. Very Good/Fair. 12mo. Penguin Books, 1990-01-02. Paperback. Used:Good. NY: Reynal & Hitchcock, 1946. beige c w/red titles; parts of dj laid in; 182 clean, unmarked pages. Hardcover. Very Good/No Jacket. 12 vo. Penguin Books. PAPERBACK. 0140035745 New Condition. . New. 2011-07-08. Good. Ships with Tracking Number! INTERNATIONAL WORLDWIDE Shipping available. May not contain Access Codes or Supplements. May be ex-library. Shipping & Handling by region. Buy with confidence, excellent customer service! Penguin Books. PAPERBACK. 0140035745 Like New Condition. . Fine. Hamish Hamilton, 1946. Hardcover. Acceptable. 1946. First Edition. 180 pages. No dust jacket. Blue cloth boards. Heavy cracks to guttering with text block becoming detached from spine. Tanning and foxing to endpapers and text block edge with thumbing throughout. Surface drop marking to text block edge. Boards have rub wear and marking with forward lean and sunning to spine. Bumping to corners, edges and spine ends. Substantial water marking. Penguin. PAPERBACK. 0241955807 Brand New ,Original Book , Direct from Source , Express 5-8 Business days worldwide Delivery. . New. Penguin Books, 2010-01-01. Paperback. Good. Penguin Books 1973 Paperback. Fair. Harmondsworth: Penquin Books 158 pages. Book is in Very good condition throughout. Stories From His Experiences As A Wartime Fighter Pilot.. Reprint. Paperback. Very Good/None Issued. Paperback. New. Includes ten terrifying tales of life as a wartime fighter pilot. Middlesex, England: Penguin, 1973. G+, Edgewear, creases, indentations, abrasion, ink name, mild foxing, browning. Short stories. Expanded condition report/digital photo on request.. First Penguin Edition. Mass Market Paperback. Penguin (Non-Classics), 1990-01-02. Paperback. Good. Harmondsworth, England: Penguin, 1973. Slight wear to cover. Ten terrifying glimpses into the nightmare of life as a wartime fighter pilot..(We carry a wide selection of titles in The Arts, Theology, History, Politics, Social and Physical Sciences. academic and scholarly books and Modern First Editions etc.) . 1st Penquin Edition. Softcover. Good. 8vo - over 7¾" - 9¾" tall. Softcover. Harmondsworth, England: Penguin. Very Good. 1973. Reprint. Softcover. 8vo - over 7¾" - 9¾" tall 0140035745 Paperback Paperback Roald Dahl's ten early short stories arise from his time as a wartime pilot. (We carry a wide selection of titles in The Arts, Theology, History, Politics, Social and Physical Sciences. academic and scholarly books and Modern First Editions etc.) . Penguin Books . Paperback (VG); all our specials have minimal description to keep listing them viable. They are at least reading copies, complete and in reasonable condition, but usually secondhand; frequently they are superior examples. Ordering more than one book will reduce your overall postage costs. Penguin Books Ltd, 01/25/1973. Paperback. Used; Good. **WE SHIP WITHIN 24 HRS FROM LONDON, UK, 98% OF OUR ORDERS ARE RECEIVED WITHIN 7-10 DAYS. We believe you will be completely satisfied with our quick and reliable service. All orders are dispatched as swiftly as possible! Buy with confidence! Penguin Books, 1990. Paperback. Good. Disclaimer:A copy that has been read, but remains in clean condition. All pages are intact, and the cover is intact. The spine may show signs of wear. Pages can include limited notes and highlighting, and the copy can include previous owner inscriptions. An ex-library book and may have standard library stamps and/or stickers. At ThriftBooks, our motto is: Read More, Spend Less.Dust jacket quality is not guaranteed. Penguin Books, 1990. Paperback. Acceptable. Disclaimer:A readable copy. All pages are intact, and the cover is intact. Pages can include considerable notes-in pen or highlighter-but the notes cannot obscure the text. An ex-library book and may have standard library stamps and/or stickers. At ThriftBooks, our motto is: Read More, Spend Less.Dust jacket quality is not guaranteed. Penguin Books, 1990. Paperback. Good. Disclaimer:A copy that has been read, but remains in clean condition. All pages are intact, and the cover is intact. The spine may show signs of wear. Pages can include limited notes and highlighting, and the copy can include previous owner inscriptions. At ThriftBooks, our motto is: Read More, Spend Less.Dust jacket quality is not guaranteed. Penguin Books, 1990. Paperback. Acceptable. Disclaimer:A readable copy. All pages are intact, and the cover is intact. Pages can include considerable notes-in pen or highlighter-but the notes cannot obscure the text. At ThriftBooks, our motto is: Read More, Spend Less.Dust jacket quality is not guaranteed. Saved By The Bell Impeach Screech! Penguin Books. Used - Good. Ships from the UK. Shows some signs of wear, and may have some markings on the inside. 100% Money Back Guarantee. Your purchase also supports literacy charities. Penguin Books. PAPERBACK. 0140035745 . Good. London: Penguin Books. Minimal wear. Later reprint. . Very Good. Soft cover. 1973. London: Penguin, 2003. new edition circa 2010,paperback,159 pages,fine.shelf 202.. New Edition. Paperback. Fine/No Jacket. 8vo - over 7¾" - 9¾" tall.